"Turning Home Cooks Into Chefs"
We are having a flash sale on today’s meal kit! The “Petit Tenderloin” is the second most tender cut of beef after the actual tenderloin. 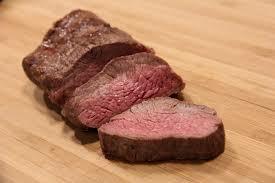 The Petit Tender comes from the chuck, or shoulder, which has greater marbling and therefore more flavor. This has been one of our slowest selling meal kits, which makes no sense given the quality of the cut of meat. After some investigation, the source of confusion appears related to our using its latin name, Teres Major. A quick GTS (Google That S#$^) search of Teres Major yields images of the “da Vinci” anatomical drawings of a human with an arrow pointing to the back of the shoulder blade with the label “Teres Major.” Okay, so that may have caused some to lose their appetite….but, to be clear, we are selling BEEF steaks…. Look, the Bos Tausus, or cow, comes from the same kingdom, Anamailia, as the Homo Sapien, or us, so there are many similarities. Just think about your last workout,….you did some upright Chuck presses to build upper body strength, some squats to tone your Round (both your Rump and your London Broil), pull-ups to better define your New York Strip, and lastly, crunches to maintain your six-pack brisket. Put in those terms, the “Teres Major” certainly sounds more appetizing!…..maybe.